During our San Francisco trip, we decided to catch up with two of our mutual friends over some delicious Western and Japanese fusion. I specifically told one of them that I wanted a dining gem in San Francisco, so we headed to The House. We couldn’t get reservations until 9pm because the place was slammed with people, so we walked around Chinatown and Little Italy for a while. 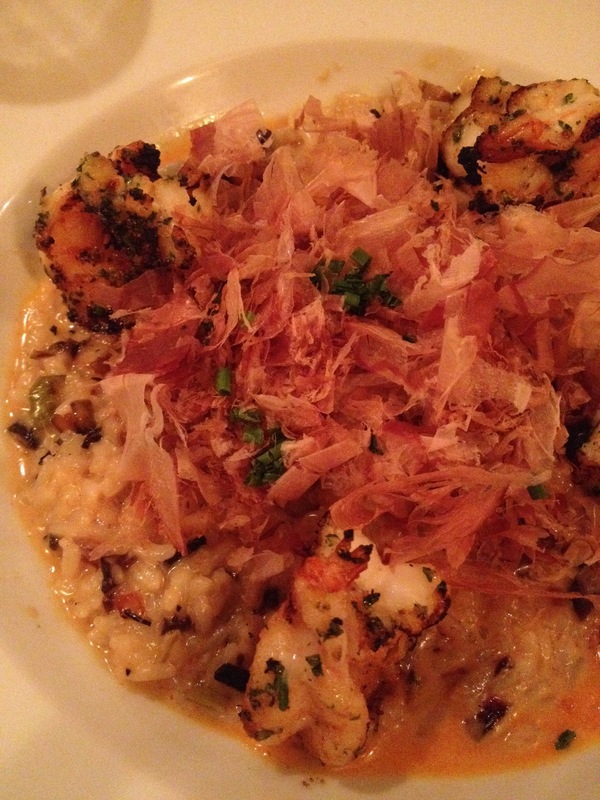 Everything on their menu might sound really Japanese but each order had an unexpected Western ingredient thrown in. You’ll find inventive and unique Japanese and Contemporary Western fusion and unlike my previous review on Miku, they do not serve sushi here. 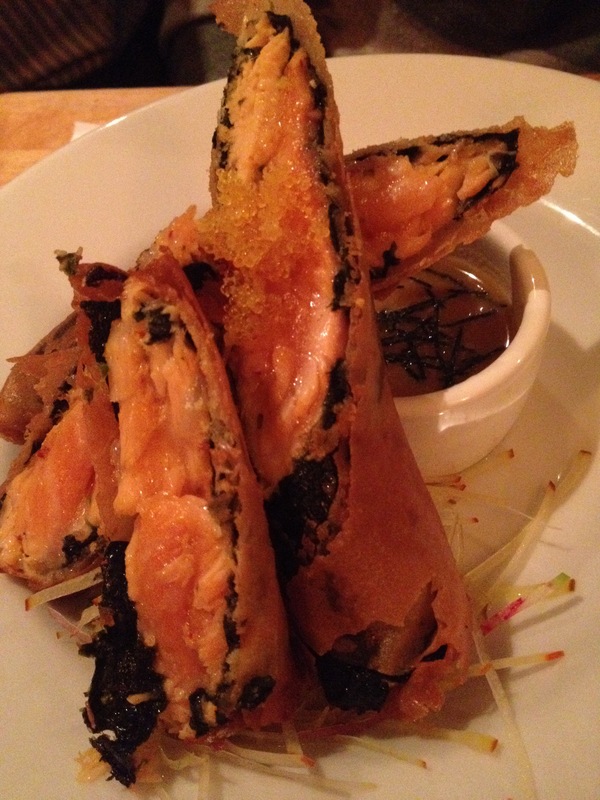 The rolls were crunchy and packed with juicy and buttery salmon and crispy seaweed stuffed inside. The best thing is that it doesn’t crumble or fall apart when you bite into it. All the juice and flavours from the salmon are sealed in. The Chinese hot mustard gave the rolls a spicy and the tingling feeling in my mouth and the spice really started to burn my lips. The Chinese mustard really hit the spot with the rolls. 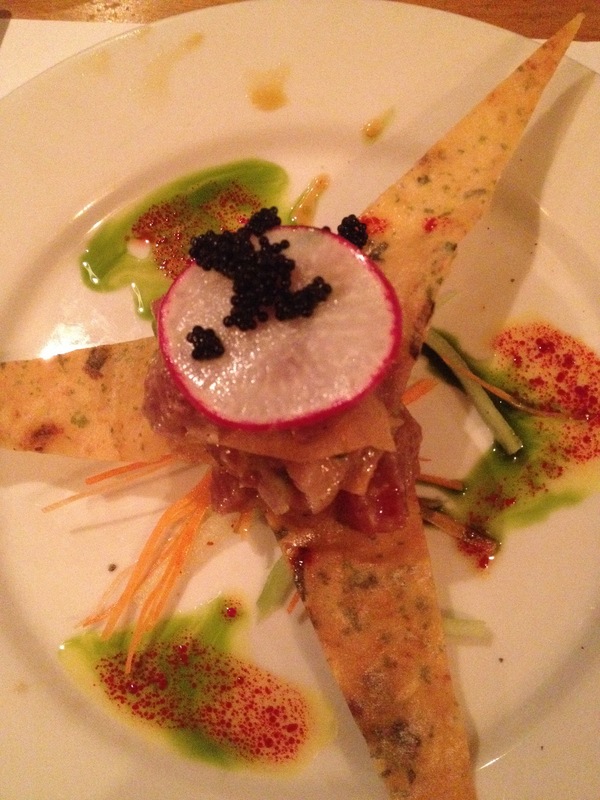 What’s in it: Roasted nori chips, ahi tuna tartare, caviar and shaved beet. Removing and eating each piece of roasted nori chip stacked with tuna tartare was like playing Jenga with my food. Big in its flavour, there was no doubt that each tuna tartare had a impish speck of wasabi concealed within the fish for that extra flair. Chunky and succulent crab meat and diced bell peppers were falling out of the cake when we were digging into it. It almost felt like we were going into a mountain to find treasure. 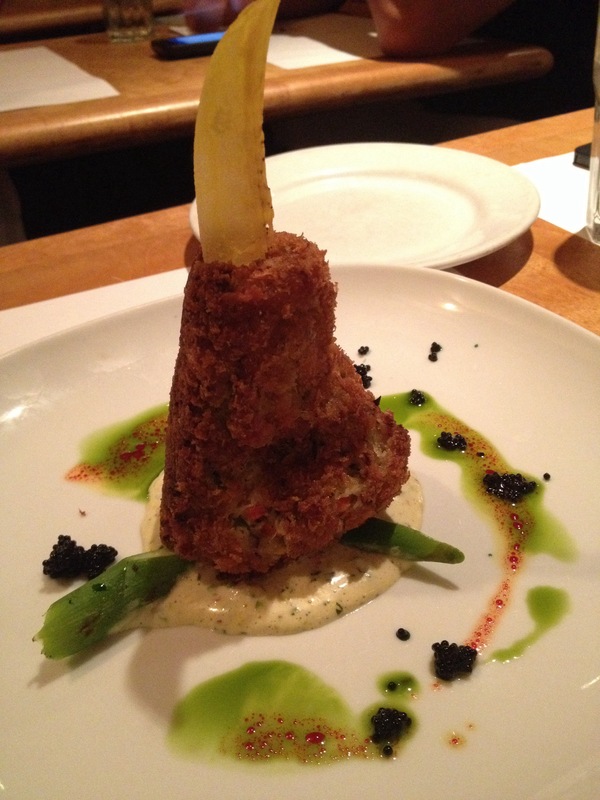 Situated on an island of pickled ginger remoulade, the ginger imparted a creamy and tangy, bittersweet flavour to the crab cake. The idea of wasabi fried noodles seemed dangerously spicy to me, but it was surprisingly very refreshing and it would occasionally hit the nose. On the other hand, you could see everyone’s face light up as they chewed on the moist and tender premium steak cooked to perfection with a ruby red centre. 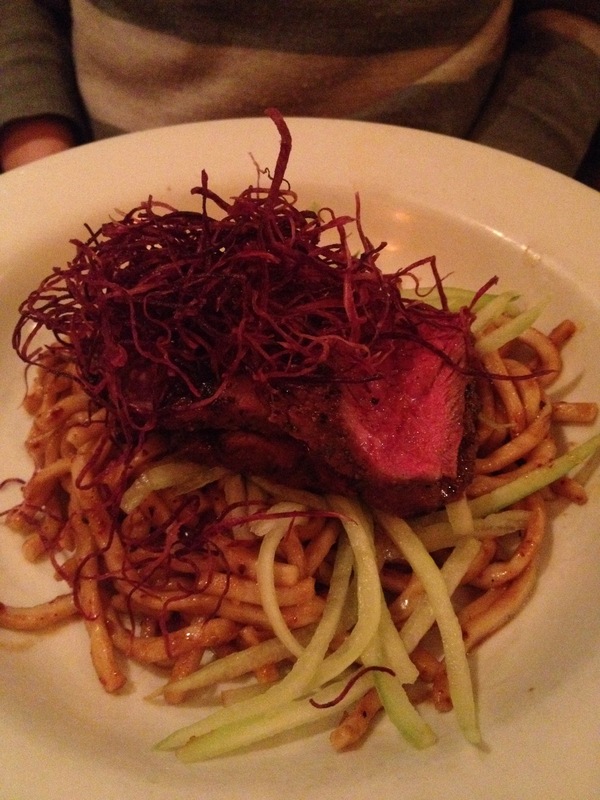 This looked a bit more mundane than our other dishes. 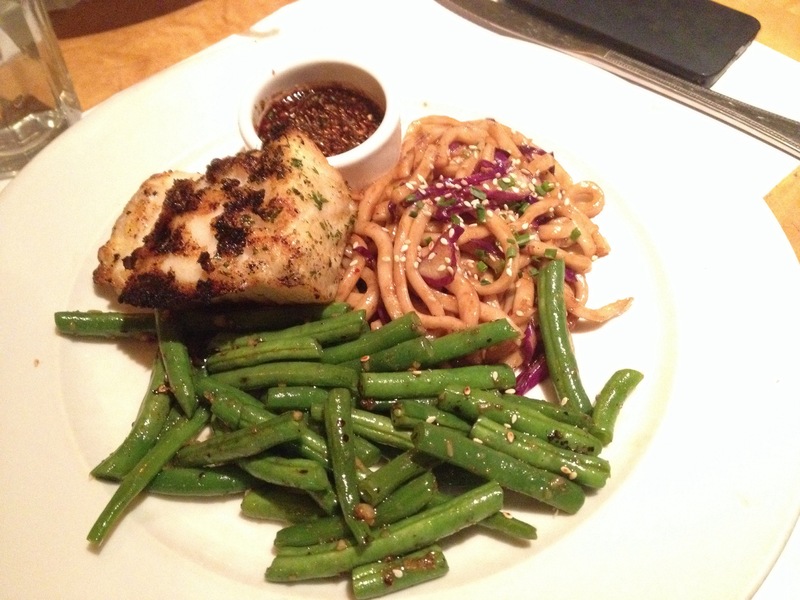 The sea bass was well seasoned and grilled to a crispy texture that sealed the juicy meat inside. Throwing in some beans and fried udon for a good measure, this dish was not as creative as our other choices. Meshing up flavours from Italy and Japan, I’m assuming the “mushroom rice” is actually risotto and it was plumpy with the proper chewiness and oozing with buttery cream goodness. In addition with some smoky charcoaled grilled prawns and delicately flaked bonito, every taste was an absolute delight.